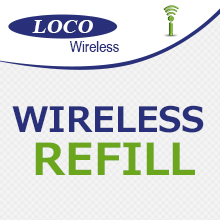 Loco Wireless offers users a straightforward prepaid service. With the exception of the $40 card, which receives a rate of $0.27/min, all calls including domestic long distance are $0.25/min. This plan would be the optimal choice for a light cell phone user. LONG DISTANCE Domestic LD is included. No charge on roaming as long as user is on the Verizon network. International Calling: Calls to Mexico/Puerto Rico deduct normal airtime minutes plus charge $0.25/min of use. Calls to Canada deducts normal airtime, and there are no additional charges. Other international calls are not available currently. FEATURES 911 & #1611 are FREE to Connect 411 Connect: $1.25 to connect plus local airtime per minute rate. Voicemail is also included. - For technical assistance, please call 1-866-778-7888.